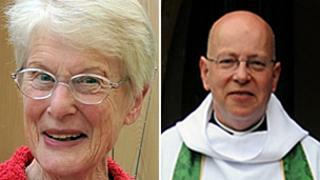 A man charged with murdering a teacher and a vicar has pleaded not guilty to both offences. Stephen Farrow, 47, is accused of murdering 77-year-old Betty Yates who was found stabbed in her cottage in Bewdley, Worcestershire, on 4 January. Mr Farrow is also accused of stabbing to death the Reverend John Suddards, 59, at his vicarage in Thornbury, South Gloucestershire, on 14 February. The hearing was held at Bristol Crown Court, and the defendant is in custody. Mr Farrow, of no fixed address, has admitted a charge of burglary relating to a separate property, Vine Cottage, in Thornbury between 21 December and 3 January. The defendant entered his pleas via videolink from Long Lartin Prison in Worcestershire. His trial is due to start on 8 October.